The Independent Corrupt Practices and Other Related Offences Commission (ICPC) has arraigned the former Minister of Niger Delta Affairs, Elder Godsday Orubebe, before a Federal Capital Territory High Court, sitting in Maitama, for allegedly diverting N1.97 billion meant for the compensation of owners of properties on Eket Urban section of the East-West Road in Eket, Akwa Ibom State. Orubebe, who had failed to appear in court on two previous occasions, is facing a six-count charge before Justice Olukayode Adeniyi, alongside an Assistant Director with the Ministry of Niger-Delta Affairs, Mr. Oludare Davis Alaba, and the Director of Contracts, Gitto Costruzioni Generali Nig. Ltd., Mr. Ephraim Towede Zari. Counsel to ICPC, Ekoi Akpos, said before the court that their offences contravened Sections 25 (i), (b); 19, 22(5); of the Corrupt Practices and Other Related Offences Act 2000 and Sections 96, 312 and 323 of the Penal Code laws of FCT 2006. ‘Conferring unfair advantage upon Gitto Costruzioni Generali Nig. Ltd, by circumventing the approval of the Federal Executive Council (FEC) for the dualization of the Eket Urban road where the former Minister`s decision to rehabilitate the road instead of dualization falls contrary to the award letter No.WR14522/VOL.1/55 dated 28/09/2006 as approved by the FEC; and making false statements to operatives of the ICPC where he mentioned in his written statement that the decision to rehabilitate the Eket Urban road was taken after he had left office as Minister of Niger-Delta Affairs.’ The ex-Minister and the co-accused pleaded not guilty to the charge when read to them. 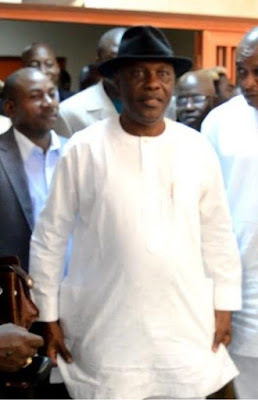 Their counsel, F. Zimuan, representing Orubebe, K. Asunogie, representing Alaba and Kanu Agabi (SAN), representing Zari, who is a Lebanese, pleaded with the court to grant their clients bail on liberal terms. Zimuan specifically urged the court to grant Orubebe bail on self- recognition, having served as a former Minister. The trial judge, Justice Adeniyi admitted the ex-Minister to bail in the sum of N10 million and a surety who must be resident in Abuja, with evidence of three years tax clearance. He further admitted Mr. Alaba to bail in the sum of N20 million and a surety who must be an employee of the Federal Government not below the rank of an assistant director. The third accused, Mr. Zari was equally granted bail by the judge in the sum of N20 million and one surety who must be resident in Abuja, under the jurisdiction of the court. Justice Adeniyi, ruled at the end of the arraignment that all the accused persons be kept in ICPC custody pending the fulfillment of their bail applications and then adjourned the case to 10th November, 2016 for hearing.